Babe Ruth was born on Wednesday, February 6, 1895, in Baltimore, Maryland. Ruth was 19 years old when he broke into the big leagues on July 11, 1914, with the Boston Red Sox. 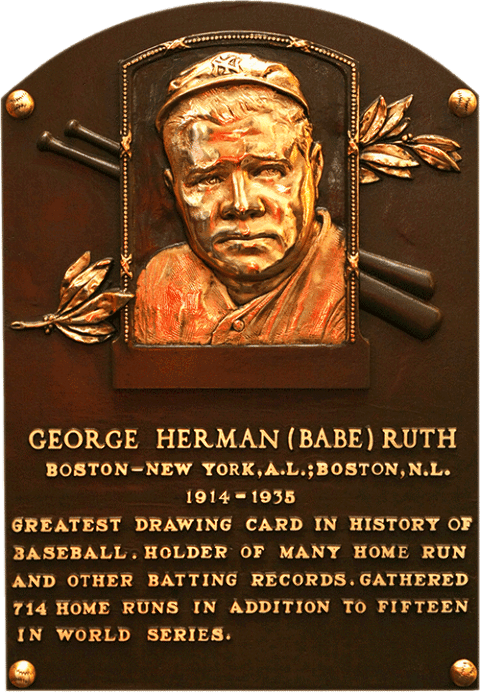 His biographical data, year-by-year hitting stats, fielding stats, pitching stats (where applicable), career totals, uniform numbers, salary data and miscellaneous items-of-interest are presented by Baseball Almanac on this comprehensive Babe Ruth baseball stats page. Babe Ruth is the single most famous baseball player in the entire world. Babe Ruth is also one of the greatest baseball players in the history of the game. The Bambino's slugging ability was so great, his last name became an adjective - "Ruthian" - used to describe performances of heroic proportion. We could effortlessly write an entire book (more books about Babe Ruth have been written than any other player) here, but will stick to a mere handful of career highlights. Babe Ruth the "champion": Ruth was a World Series champion seven times ( 1915 , 1916 , 1918 , 1923 , 1927 , 1928 , 1932 ), the American League home run champion twelve times (1918, 1919, 1920, 1921, 1923, 1924, 1926, 1927, 1928, 1929, 1930, 1931), the RBI Champion six times (1919, 1920, 1921, 1923, 1926, 1928), the On-Base Percentage Champion ten times (1919, 1920, 1921, 1923, 1924, 1925, 1926, 1927, 1930, 1931, 1932) and the Slugging Average Champion thirteen times (1918, 1919, 1920, 1921, 1922, 1923, 1924, 1926, 1927, 1928, 1929, 1930, 1931)! Babe Ruth the "home run king": Ruth was the first player in Major League history to hit 200, 300, 400, 500, 600 and 700 home runs. In 1919, Ruth hit 29 home runs becoming the all-time single-season home-run leader. A year later Ruth hit 54 home runs, breaking his own record as the all-time single-season home run leader and became the first player to hit over 50 home runs in a season. The very next year, he hit 59 home runs, breaking his own record yet again. Finally, in 1927, The Sultan of Swat hit 60 home runs, breaking the mark and establishing a plateau that was legendary for decades. Currently, Ruth still holds records for most home runs in any decade (467 in the 1920s), fastest player to hit 600 home runs (2,044 games) and fastest player to hit 700 home runs (2,418 games). Babe Ruth the "best left-handed pitcher in baseball": Ruth was 18-8 with a 2.44 ERA his first full season on the mound (1915), twenty-wins club (23-12) the very next year (and the ERA Champion , 1.75), and twenty-wins club (24-13) the year after that. Ruth still holds pitching records for most shutouts in as season by a lefty with 9 (tied by Ron Guidry in 1978) and most innings pitched (14) in a World Series game, on October 9, 1916 , a complete game 2-1 victory. Babe Ruth the "postseason prince": Ruth set World Series records with 3 homers in a game (and did it twice) and 12 total bases in a game. His 15 postseason home runs, all hit during World Series games, were a record until Mickey Mantle tied him in 1963 then eventually passed him in 1964. And let us never forget the 1932 World Series , legendary and debatable still to this day, courtesy of "The Called Shot". Babe Ruth the "nickname collector": Babe (which some actually believe is his real name due to its use) probably had more well-published nicknames than any other player and here are but a few we have seen in print: The Bambino, The Sultan of Swat, The Colossus of Clout, The Wazir of Wham, The Maharajah of Mash, The Rajah of Rap, The Caliph of Clout, the Behemoth of Bust, The Mammoth of Maul, The Mauling Mastodon, The Mauling Monarch, The Wali of Wollop, and to his teammates, Jidge. Babe Ruth the "hall of fame legend": Ruth was elected to the Baseball Hall of Fame on February 2, 1936, by the Baseball Writers Association of America, as part of the inaugural class of inductees. At the time of his induction, Ruth held literally hundreds, and we mean hundreds , of baseball records . The single most prolific hitter in baseball history, a key component in "Murderer's Row" and a charismatic personality - both on and off the field - that made him a larger-than-life figure and one of the greatest sports heroes, not just in baseball, but in American culture. Babe Ruth is part of an elite set of pitchers in Major League history whose career on the mound spanned at least ten seasons and NEVER once included a losing record! The other aces: Spud Chandler (11 seasons), Dizzy Dean (12 seasons), Dave Foutz (11 seasons), Joe McGinnity (10 seasons), Deacon Phillippe (13 seasons), Jay Powell (11 seasons) and Urban Shocker (13 seasons). The National Baseball Hall of Fame inaugural class included: Ty Cobb (98.23%), Babe Ruth (95.13%), Honus Wagner (95.13%), Christy Mathewson (90.71%) and Walter Johnson (83.63%), five of the finest players in baseball history selected to begin a tradition in Cooperstown.